The Blackheaded Persian originated in the arid regions of east Africa in what is now Somalia. It is one of the fat-rumped breeds and both sexes are polled. The breed is now found in South Africa where they are sometimes known by the name Swartkoppersie (Afrik.). It also found its way to the tropics of the Caribbean region via South Africa many years ago. The Caribbean population has adapted well to the humid tropics. The breed known in Brazil as the Somalis Brasileira, Brazilian Somali or Somali Blackhead is comprised largely of sheep with Blackheaded Persian decent with some authors suggesting local breeds also make up a small percentage of the genetics. 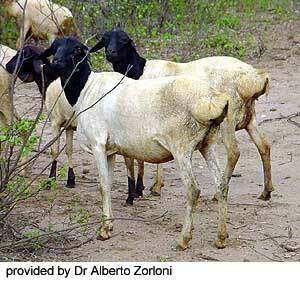 It is recognized as an official breed by the Brazilian Sheep Breeders Association. They have a white body and black head and neck with the two colors sharply distinguished. They have a fat rump, short legs, and a compact conformation. In the Caribbean region, the average litter size was 1.08, and the 95 day lamb weight was about 13 kg for singles. Mature ram and ewe weights are approximately 50 and 30 kg, respectively.